This entry was posted in Media and tagged New York Times, NYT, paywall by Erick Schonfeld. Bookmark the permalink. The big news is that the revenue at the news media group is now growing for the first time in years. If you want to know how they would have done without the paywall, it is very easy. Look at the revenue numbers at the Guardian and Washington Post- dreadful. I know journos love their work to be seen, but I imagine keeping their jobs is up there too. Good point. 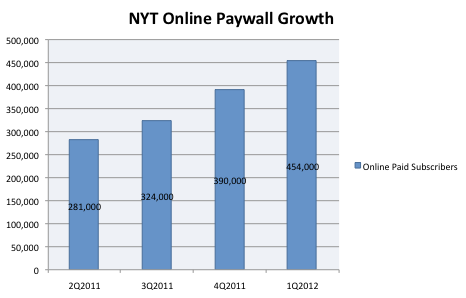 And look at WSJ, only paper with more paid online subs and doing even better than NYT. They are in a much better position. People are far more willing to pay for information that directly impacts their business decisions. That’s all a very nice story, but anytime I ever wrote to the NYT they never ran any of my replies to editorials and they don’t seem to have any minority reporters points of view. So I guess I’ll just keep my money in my pocket (cause they won’t hire me) and read google news for free and write my own blogs like you. Are you sure that those digital subscriber numbers are *digital only* (ie, not getting digital access *free* as a result of being a print subscriber)? I’ve read multiple NYT 10Q’s and its latest 10K and I see very, very few specifics about the much-ballyhoo’d “success” of the paywall (a dying MSM has exempted the NYT from close scrutiny, in its desperation for salvation from the internet). I have a very strong sense that the NYT is gaming the numbers through use of ambiguous wording (you’ll note *they* never say “digital only” – they leave that up to their lazy MSM compatriots). Again, are you sure that the NYT isn’t using the free digital access that comes along with continued paper-based subscription to create an astoundingly misleading impression? That would exclude the print subscribers who get digital access for free. Hmmm…maybe the ‘success’ here is just being able to turn the tide just slightly. And that’s my takeaway…this has been a slightly successful initiative. Is this hopeful news for the industry? IMO…too soon to tell. Alright. Let’s face it. The Freekly is mainly used to line bird cages and stuff pcegakas. When I did read it, I just looked at Risa’s Astrology and laughed.If you want a good hot dog, eat a Boar’s Head one. If you want a good burger, Brenda’s is an excellent choice.If you want a good chicken sandwich, check out the new Chick Fil A on sixth street. Ya’ll know what I’m talking about.I think the press release went out on Friday at 5 because they were trying to get it done before they left for the week? Also, since the equipment is new to our area, it doesn’t surprise me that it wasn’t known offhand how much it would cost to repair. my sympathies were and awlyas will be with the dumpy nerd in that situation, not the cool/popular kids, whose outward self-esteem was often a brittle mask. In fact, all that effort spent trying to be cool and popular was often based on a lack of self esteem, not a healthy excess of it. In fact, since those dumpy nerds were and are often smarter and more forward thinking than the cool/popular folks, I have a hard time with the roles you’ve assigned to the two papers/news sources/whatever we call them now. As a big fan of the Flyer and not a fan of cool/popular, I call total analogy fail, at least for me. @LeavnF’ville- Evil? really? Paid parking might be a PITA, it might or might not be a good idea right now, but it hardly rises to the level of evil, and any self respecting counterculture oughtta have bigger fish to fry. like it, don’t like, oppose it, whatever. But neither side of that is particularly countercultural. I don’t think there’s been anything countercultural happening on Dickson for a looooong time now, the rents are too high.